Imagine, there was a way to boost the productivity in the Trello boards you use. Imagine, you could build your Trello boards and set up processes so that you don’t have to spend your valuable time any longer checking on labels, due dates, and updates from your remote team members. Imagine, you could manage an outsourced team and create impressive workflows and automations in your Trello boards. The good news is, you can! If you’ve ever had this nagging feeling that you wanted to be able to do more with Trello, your time has come. In this article I am going to introduce you to a tool that not only lets you automate Trello boards, it actually revolutionizes the way you use Trello because you start thinking in workflows when you design your project boards and team processes. The tool is called Butler for Trello. Butler for Trello is a little Bot that automates the actions you do in Trello, particularly those that are merely repetitive in nature. It’s been made to work exclusively with Trello, and it can do this in two different ways: either as the ButlerBot or as the Butler Power-Up. 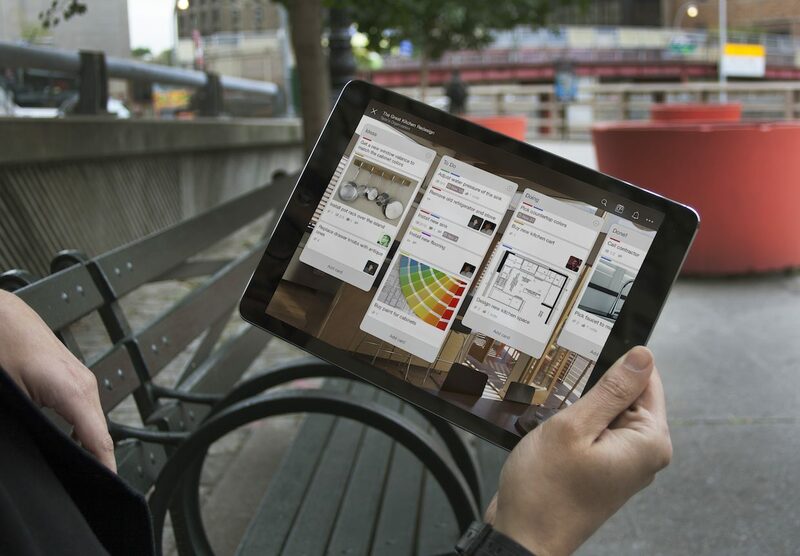 With Butler, you can automate Trello boards and create useful workflows. To automate Trello boards with Butler, no programming language needs to be learned. All that is required is plain English. If you have a familiarity with the linguistic usage of the English language, you are good to go. If writing commands in English sound overwhelming to you, it’s probably best to use the Command Builder at first. With a little bit of exercise, you’ll get a feeling for its syntax and will soon be able to write your own commands and begin to customize and automate your Trello boards. But besides these examples, you can also use Butler to automate tasks that couldn’t be done by hand. For instance, think of the creation of a card in another board upon a certain trigger. Or, fully syncing two cards on two different boards. You can concatenate multiple actions into one command, which allows you to run impressive workflow sequences. Depending on what you use Trello for, with Butler for Trello there is immense productivity wins possible. For experienced users, there are also advanced features available that run with complex conditions, variables or even externally triggered scripts. In order to use this tool, you need to authorize Butler to access your Trello account. To do so, open Butler’s dashboard in a tab on your browser. Then, make sure you are logged into Trello in a separate tab on your browser. Allow Butler to connect with Trello, and invite Butler to each individual board you want to use it with. This invitation creates a new list, the Butler list, in the first position of your board. You can drag it to any position you like on your board. Generally speaking, there are two ways to automate Trello boards with Butler for Trello. The first one is the Butler Bot. The ButlerBot is a little robot disguised as the board member @ButlerBot that performs actions on your behalf. 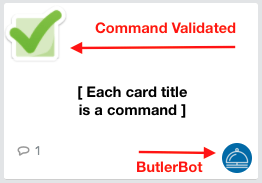 Each card title is a command, and the ButlerBot attaches itself as a member to each command card. By default, every command recognized as valid and understood by Butler gets a green checkmark sticker. Inside the card, in the comment section, Butler adds a comment “Understood” when the command is correct and understandable. The second option to automate Trello boards with is the Butler Power-Up. Power-Ups in Trello are additional features that let you execute and/or automate tasks with various 3rd party tools. The Butler Power-Up allows you to add contextual buttons to a Trello board, that when clicked, perform automated series of actions. Note that you can either use the ButlerBot or the Butler Power-Up in one and the same Trello board. There are quite a few differences between these two. The tasks achievable with the ButlerBot are not yet matched by the Power-Up. The ButlerBot has existed for longer and has more capabilities than the Power-Up. But be assured there are more features in the works for the latter. One important difference between these two is that commands executed by the ButlerBot are displayed as executed by the bot. The Butler Power-Up acts as yourself, meaning all actions done by the Power-Up appear as executed as you, the user, and not by the Bot. Further usage limits on these two options are laid out in Butler’s pricing policy. Whilst there is a generous free plan with which you can use both applications, there are some restrictions on the Power-Up in place you better know about before you start using it. Like with most tools, there’s a bit of a learning curve ahead to understand its terminology. With Butler, it’s not that bad. I find its terminologies pretty intuitive and there are clear similarities to other automation tools. Command: A command is generally composed of two things: a trigger and an action. Trigger: Part of a command. Specifies when (under which circumstances) an action should be performed. Trigger Card: Cards that trigger a command and on which Butler performs operations. For example, when they are moved to a list, or when their due date matches a due date command. Action: The other part of a command. An action is what you would like Butler to do for you. One action usually involves one operation, but more complex workflows do require multiple actions. Multiple Actions: A command can have more than one action. A command requiring multiple actions requires as many operations as the sum of all actions. Operations: One operation will at the very least save you one click. More likely, it will save you multiple clicks or allow you to do something that is not even possible manually. Command Builder: Part of the Butler Dashboard and a great way to create commands. Great way to get started for inexperienced folks. Weekly Quota: There’s a weekly quota of operations allowed based on the pricing plan chosen by you. With the free plan, you can currently use up to 250 operations per week. The first paid plan allows you up to 2.500 operations per week with the ButlerBot. Quota Reset: Quota reset happens every Sunday at midnight GMT. If you are not familiar at all with writing a line of code, the Command Builder is the place to go for you for creating a command. On the other hand, if you already have had some encounters with one or the other programming language, you still want to check out the Command Builder first – just to get a feeling of what possibilities there are to automate Trello boards. But first things first. 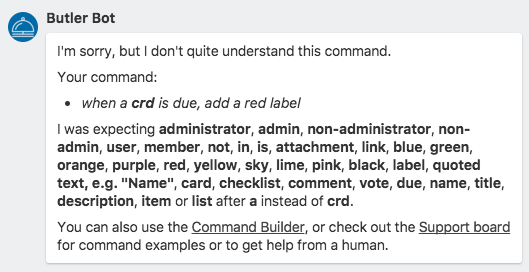 What exactly is the Command Builder? The Command Builder a dashboard-like interface where triggers and actions can be selected from dropdown lists. On the left, you can choose between three different types of triggers, and I’ll talk about them more. On the right, however, are dozens of actions awaiting you to choose from. Commands consist of either one trigger or no trigger. No trigger means the Bot is continuously checking back and would execute its actions immediately. On the other hand, a command can hold multiple actions at once. There’s a limit on the number of actions a single command may have: currently, it’s 20 actions for free accounts and 40 actions for paid accounts. Using the Command Builder is without a doubt the easiest way to create a valid command for Butler. Not much can go wrong here. By simply clicking on the different options, you can pick your actions or action sequences, and create commands that serve your board setup as well as your team’s working style. Triggers and actions are the centerpiece of every automation tool, and it’s no different with Butler for Trello. Both elements have different nuances, which tip the scales here and there. So let’s have a closer look at both of them to understand when to use them best. The when-trigger performs an action when things change on the board: e.g., when a card is added to list “To Do”. As I pointed out earlier, there are also scenarios thinkable of when a trigger isn’t required for a command to be executed. For instance, the action of counting cards in a board or list does not necessarily require a trigger. Same applies to the action of sorting cards. Whilst it can be set up with a trigger, like “every Monday at 8 am,” setting up the counting cards action without a trigger, would continuously update the card count the moment a change occurs. Whether you use this or not, depends on how busy your board is and if an immediate update is what you really need. If your board is indeed very busy, using a command without trigger will cause your weekly operations limit to be eaten up very quickly. Should you have a busy board, you may want to think twice if this is your best move, as this can quickly eat up your weekly operations limit and cause other important commands not to be executed anymore. 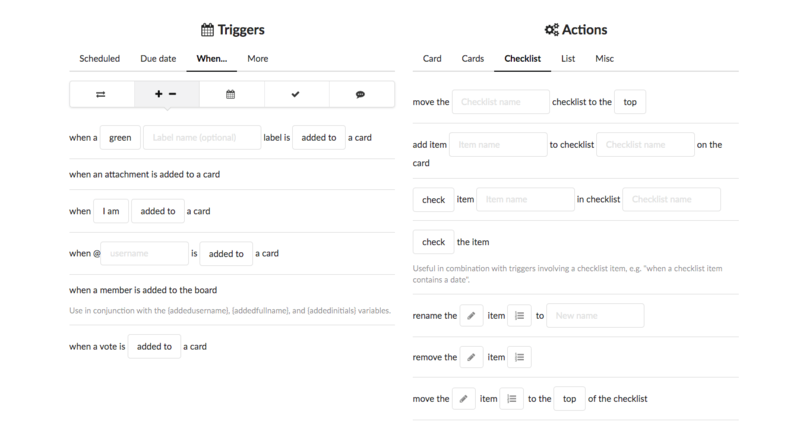 Now, let’s have a look at what actions are in Butler for Trello. An action is what you would like Butler to do for you. I mentioned before that a command can have multiple actions. This, indeed, is more the rule than the exception. Action types can be broken down into four categories: board actions, card actions, list actions or settings actions. All four types of actions can be combined in one and the same command. As you see, the options are manifold, and the possibilities of what can be achieved are literally endless. One more thing you should be aware of is the correlation between actions and operations. A command performing multiple actions requires as many operations as the sum of all the actions. Whilst you are free to set up a command with multiple actions, you should remain aware that this kind of commands will significantly lower your weekly operations budget if they are executed a lot. I already have talked about creating commands within the Command Builder. But there is also a different way, outside the Command Builder. And that’s what we are going to look at now. Commands can be created directly in the board. 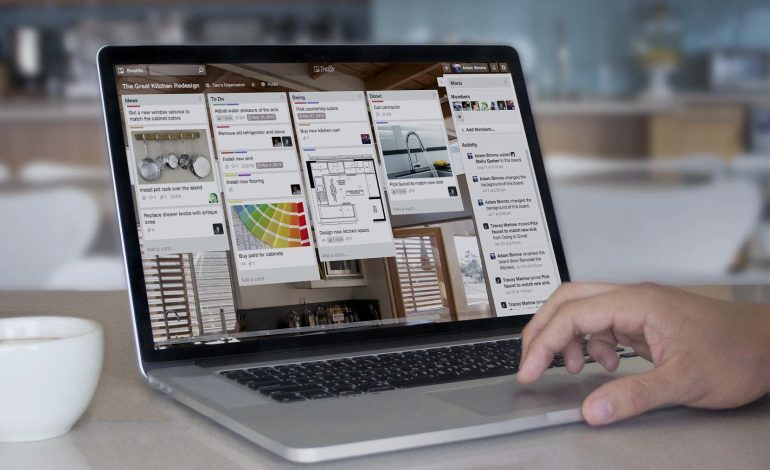 Every board connected with Butler for Trello contains a Butler list. The Butler list is the place where command cards can be written in. Each card created in the Butler list gets added the @ButlerBot. The little blue icon in the right corner indicates that the @ButlerBot has joined the card successfully. In the same moment, Butler checks the command card for its validity. Is the command valid? If there are any typos or significant errors, a command won’t be understood and will get an orange warning sticker instead of the green checkmark sticker. If you don’t like the usage of stickers, you can turn it off in Butler’s dashboard – at least for the green “check” sticker. In this case, the error identification is quite simple, because there’s only a typo that’s causing the error. In cases, however, where you have a more complex syntax, it makes sense to have a look at what Butler recommends in the comment lines for solving the issue. Sometimes, it’s just a little word missing, like an “a” or “the” or a verb that indicates an action to be taken. If you run into such a scenario, stay calm and play around with the words. Nothing bad will happen and no harm can be done whilst the command has an orange sticker. Butler won’t execute it until it finds its syntax correct. Finally, when a command is correct, Butler will simply state: “Understood.”, and run the command as soon as the trigger fires. One final word about creating commands. If you’d rather not use the Butler list for creating commands but the Command Builder, that’s fine. It’s definitely a good place to get started. However, I want you to be aware that the development of the Command Builder has not fully kept pace with all the parameters that Butler can actually use in commands. Butler for Trello is quite a new tool on the market and still in its development stage. Since the time I have been using Butler, I noticed that several new features and actions had been added, widening the scope of achievable tasks. It’s also good to know that there is a public Trello board that can be used as a knowledge base but also for requesting support. Butler’s support is legendary for its promptitude, friendliness, and helpfulness! And if you find yourself in the need for asking for a certain new feature, that’s also the place to go. The promptitude of implementation may vary, but sometimes, a new feature had been added the day a user asked for them, so don’t be shy! A workflow is a series of actions executed by Butler. It can consist one just one single command card (that contains multiple actions), or it can be made of several commands that logically belong to each other. To set up a workflow, you will first have to think about what it is you actually want to accomplish. Which part of your Trello board would you like to automate? What exactly is it that costs you a lot of time to do manually? Can you think of a change in your standard process that would give way working faster, more transparent or more reliable? Yes, what exactly is it you want to gain from using Butler to automate your Trello boards? 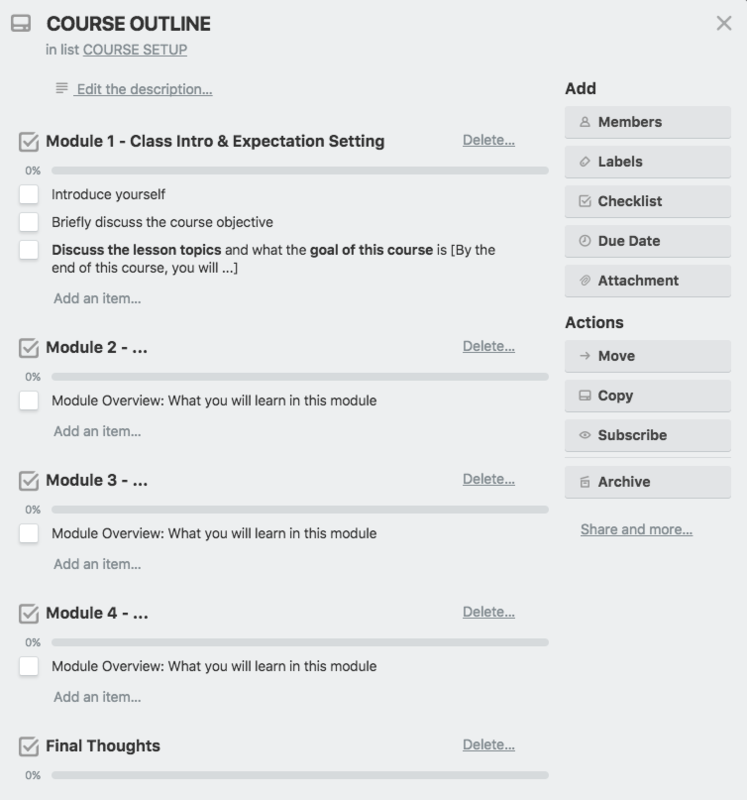 One of the board setups I have used Butler for successfully was a Trello board where I plan and outline my online courses. I needed a place that kept track of all the single steps, showing me at a glance where exactly I am at, what is still missing for each lesson and how far the project had actually proceeded. In this board, I am working a lot with labels. On the one hand, the label colors signal to me the status of accomplishment. On the other hand, they are perfect for triggering successive workflows. It’s difficult to come up with general rules of how workflows have to set up. Every person is using Trello in their own way, which makes it highly unlikely that one user’s workflow is identical to that of another user. I first created a card with several checklists; each checklist being a module whereas the checklist items would be the lessons for each module. Here’s an outline of the draft card I used. In a second step, I created a command that would convert the single checklist items and create a bi-directional link between them. A bi-directional link means that both the checklist item and the card hold a link to each other. Not only would this allow me to find a certain card very quickly on the board. It also enabled me to have the checklist item checked off automatically once the linked card (=lesson) was marked as ready. Having a card for every single lesson instead of only a checklist item, gave space for jotting down notes and reminders, or adding links and attachments – a necessity for anything in a development stage. That’s an example of one workflow I have created in this course development board. What it did for me, was, it gave my development process a structure I did not want to miss. And it significantly reduced the check-in time for me when I wasn’t working on the project for a couple days. Seeing at a glance what I hadn’t finished and which bits and pieces were still missing tremendously leveled up my self-organization and project management. The process of setting up workflows has always been an iterative one for me. I adapt steps as I go and let the workflows grow. But what if you are not using Trello for yourself, but in a remote team? How can you use Butler for Trello in boards where multiple people in different locations are involved? The answer is, by putting inclusive processes in place which effects trickle down into a successful experience for everyone on the team. One of the main challenges for remote team members is the question of being and remaining visible in the digital workspace. The kind of nuanced conversation we know from solid workspaces don’t work that well in the digital world. Tools matter a lot and are used to bridge the obvious communication gap. When a remote team uses Trello for internal organization processes, adding Butler for Trello to the toolkit will advance the digital workspace in a way that standard processes can be put in place that wasn’t possible before. Both the ButlerBot and the Butler Power-Up are suitable candidates to automate Trello boards for remote teams. Upon using the Power-Up button in a shared board, standard processes can be triggered when a certain result has been achieved – independent of any calendar date or other processes happening on the board. For instance, after finishing a certain project phase, the execution of the Butler Power-Up button could prepare the team’s board for the next project phase. The ButlerBot is just as useful as the Power-Up, if not more! The ButlerBot is the proper tool to use in boards where the execution of workflows depend on the triggering of hard due dates and/or events happening on the board. The good news is, that you can use both tools at the same time on the same board – and even let them interact with each other. For instance, let’s say a remote team would be using the Butler Power-Up to prepare the board for a new project phase. Upon pressing the Power-Up button, new cards would be created, or new labels would be set. And then workflows executed by the ButlerBot could step in, establishing traceable standard processes and a positive experience for everybody on the team. Now that you learned about the potential ButlerBot can help with to automate Trello boards, do you already have ideas on how to use it for your remote team? 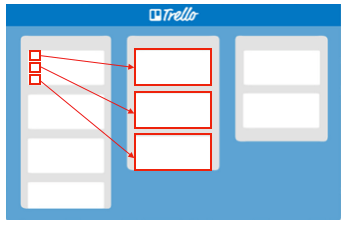 No two Trello boards are the same, and processes are more often subject to change than we admit. To get a taste of how well Butler for Trello works, you may want to start with a stand-alone Trello board and compose a few commands that allow you to get rid of repetitive, manual tasks. Like moving cards from one list to the next, or changing labels. You could also involve your remote team in identifying standard processes it wants to put in place to make their work experience more enjoyable and productive. 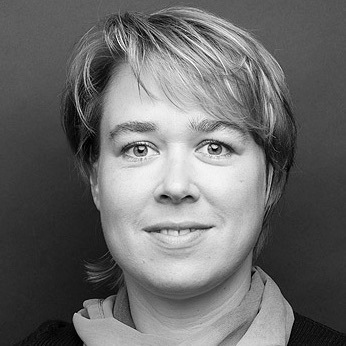 Katrin Anger is passionate about finding ease and grace in making technology work for online entrepreneurs and small businesses. As a writer, editor and tech consultant at inspirITing, she helps people with the challenges of the digital age.